Johann Elias Ridinger (Ulm 1698 – Augsburg 1767). OMNIA MIHI SUBDITA. The Rule of Death. Tomb with death from whose head with an hour-glass adorned with bat wings on top a veil flows down on the back and laterally, enthroned above all the stuff of this world – represented outer right by a hemisphere – as there are gold, goods, seals + orders, crowns, scepter, orb + weapons, folios + cassock, scientific + agricultural instruments and nolens volens maulstick + palette with brushes. The right, however, holds a high tombstone, pointing with an arrow marked as “Presens” in the left at the inscription’s said final words OMNIA MIHI SUBDITA. 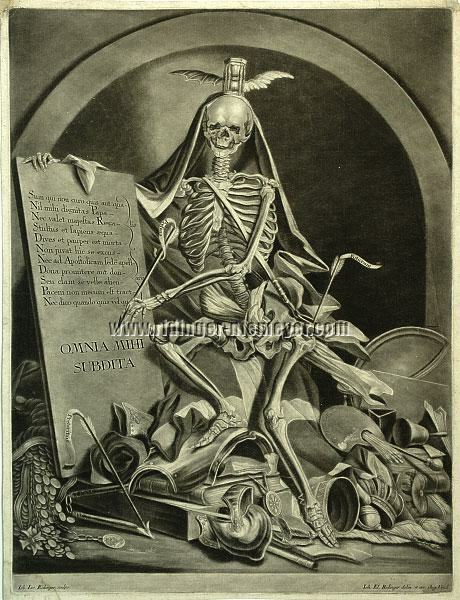 Mezzotint + outline by Johann Jacob Ridinger (1736 Augsburg 1784). Inscribed: Ioh. Iac. Ridinger sculps. / Ioh. El. Ridinger delin. et exc. Aug. Vind., otherwise as above and below. 21⅞ × 16⅝ in (55.7 × 42.2 cm). Provenance: Counts Faber-Castell, their Ridinger sale 1958 with its lot no. 146/2 as well as by the collection in pencil “(Invoice of) 14/3 1914” on the underlay carton; Radulf Count of Castell-Rüdenhausen (1922-2004). Stillfried (3rd appendix to Thienemann, 1876) + Schwarz (Gutmann Collection, 1910) 1427 (without reference to outline engraving), here though as state II (of II) as unbeknownst to either; Reich auf Biehla 296 ( “Extremely rare”, 1894 ! Without reference to state/version); Wend, Ergänzungen zu den Œuvreverzeichnissen der Druckgrafik, I/1 (1975), 290 with knowledge of Stillfried/Schwarz; Georg Hamminger 1886 (erroneously as St. 1527; “Mounted. Of greatest rarity”, 1895 ! Ditto without knowledge of state/version); Faber-Castell 146 (without recognition as differing second state, otherwise together with Schwarz 1477); Niemeyer, (The Vanitas Symbolism with Johann Elias Ridinger) in Wunderlich (ed. ), L’Art Macabre 2, 2001, illustration p. 105 (copy of the National Print Room Munich). Not in Thienemann (1856) , Weigel, Art Stock Catalog, pts. I-XXVIII (1838/57) , Silesian Ridinger collection at Boerner XXXIX (1885) , Coppenrath Collection (1889 f.) , Helbing XXXIV (Arbeiten von J. E. und M. E. Ridinger, 1554 items; 1900) , Schwerdt (1928/35) , Rosenthal, Ridinger list 126 (1940). The second state as unbeknownst to both Stillfried and Schwarz of, as hitherto not recognized , the first version of this incredibly fascinating sheet from the plate shortened at top with at the same time modified signature, both according to the copy of the National Print Room Munich, too. Schwarz’ presumption that the differences of his variant 1477 unbeknownst to Stillfried were merely due to the reworking of the plate is incorrect. It is a repeated version from its own plate with, however, a decisive re-attachment of weight in the inscription’s message. The both in print as preservation very fine copy in velvety brown-black with palpable chiaroscuro and the watermarks WANGEN and separate IV standing for contemporary impressions and surrounding margins of 4-8 mm. Both the two upper corners of it with backed tiny injury due to previous removal of old corner mounting on blue paper. On the left side besides backed minimal marginal tear outside of the platemark. In he lower left corner faint tidemark visible only in the white margin and the signature field. In the subject itself apart from that a small thin paper spot perceptible against the light only and a pinhead-small abrasion in the background of the vault. – Extremely rare.